Prices start at around $25-$50, just add PS2 keyboard, VGA Monitor, or TV. Runs BASIC language, or C. Save programs to uSD card, or internal flash memory. Or simply run via a terminal program from any PC. Arduino Shield foot print on many boards. 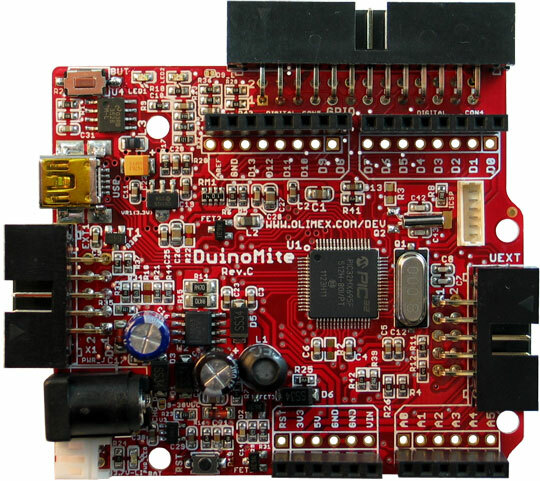 DuinoMite is a MaxiMite Compatible Basic computer, originally designed by Geoff Graham, with additional features and Arduino shield like layout. 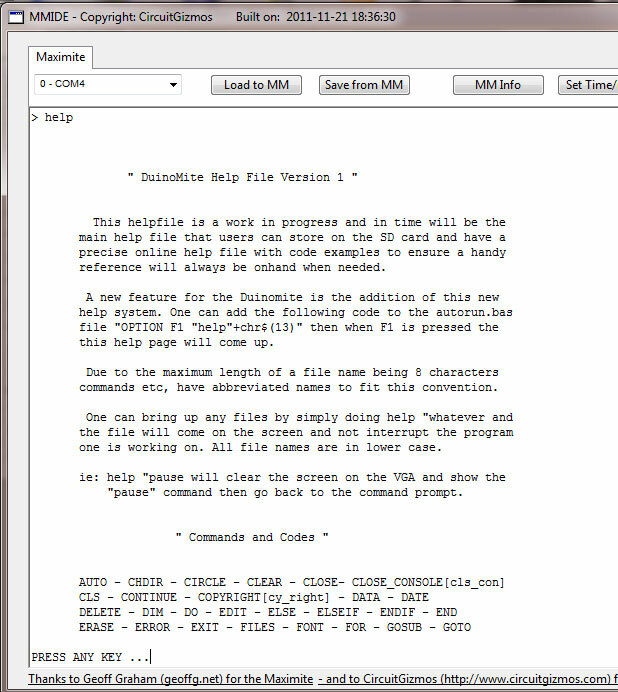 DuinoMite allows you to program in the BASIC language and have VGA and Keyboard interface, so you can develop and write your code in Basic without the need of any computer. You can store your code on the SD-CARD and execute it on power up though autoexec.bas main code. BASIC programs can easily be exchanged and saved to a PC using either a terminal program and a USB connection, or the SD card. An internal flash memory drive can also be used to save up to 256K of programs and files. Development can be done on the USB only connection. Fantastic user support via a very active user forum group. The BASIC is 100% software compatible with the original MaxiMite Version 2.7a, however additional commands and features have been added to the DuinoMite. On the MaxiMite, you have access to 20 external I/O connections, compared to a possibility of 22 on the DuinoMite. There has been BASIC commands added to control both the SD card, and VGA settings for the five pins that are shared on the DuinoMite. However with the internal A: Ram drive, the shared pins of the SD card shouldn’t be of any real concern in most cases. With control over both the SD card and the VGA, this means the full 22 GPIOs can be accessed for most applications. The DuinoMite uses three real UARTs at full speed. There are no real UARTs in the original MaxiMite design, as all serial I/O is bit banged. Olimex have designed a special serial port using a 10 pin IDC header. It is available on all DuinoMite boards. In fact, the MEGA has two. One internal, and one external. 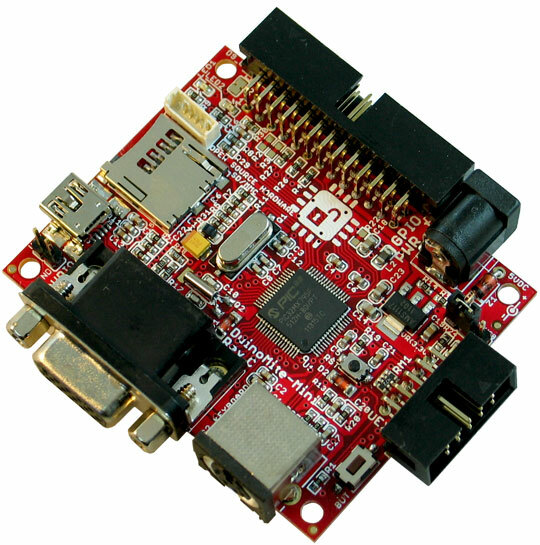 The DuinoMite is capable of high speed data transfers via this serial port, and carries UART serial communications, SPI, and I2C protocols. The I2C protocol is in theory, capable of having 100+ boards cascaded to the 10 pin IDC header, via a flat ribbon cable daisy chain. The DuinoMite manual currently is 230 pages and growing. The origional MaxiMite manual is 37 pages. You will find MaxiMite kits on the market with prices right up to $90. There may be $20 or less worth of parts, including the case. These parts are nothing special, however the retail margin certainly is. 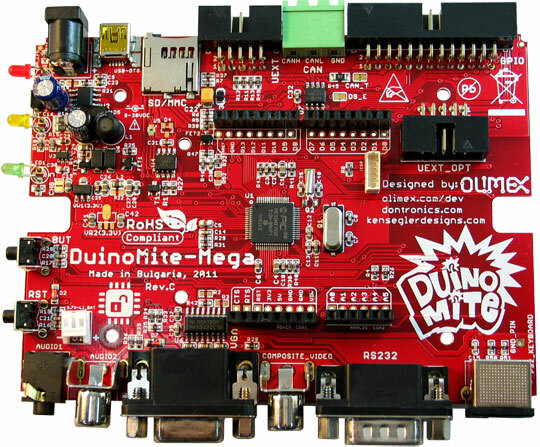 DuinoMite assembled boards can be as little as a third of this price in some cases. And all Olimex DuinoMite boards have carefully selected components to work reliably in an INDUSTRIAL temperature range -25+85C so the board can be used in INDUSTRIAL applications. Check the voltage regulation, and low power battery operation for each board. (NOTE Mini board only has +5 Volt input). Run as a PC, by attaching a VGA monitor, or TV, and a PS2 Keyboard. Save files to the SD card, or the internal flash drive. Use any computer that supports a USB port, and a Terminal program, and you can run BASIC Programs, and develop directly from your computer. Save files to the SD card, the internal flash drive, or your PC. You can run two keyboards, and two screens in parallel, or remove any single item, and the unit will still operate. 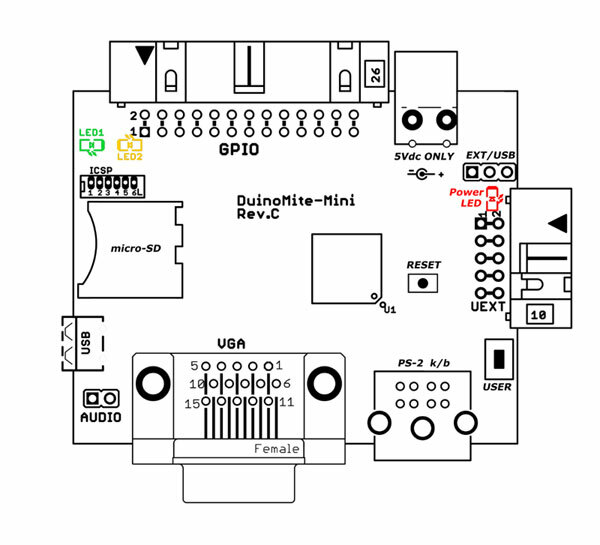 If you are running the standard DuinoMite board as a controller, and you don’t need a keyboard, or screen, you can disconnect the IO board completely. Unfortunately Olimex provide links to files and documents on their product pages, that are file name specific, instead of simply pointing to a directory. When they update a version number for instance, the link is broken, and so is every link on the web that every dealer that has gone to the trouble of placing. I have to edit those links when I get customer complains. As such, I don’t intend to chase new links for DuinoMite, as I believe there will be many. I would rather edit an external link, or upload a new file, than to edit multiple products all the time. Please let me know if my file or link is out of date. The DuinoMite versions will have additional features because of the hardware serial ports ect., plus any other new features Ken Segler Designs, or anyone else adds, like the Full Screen Editor and Terminal program. If Geoff Graham wants to add these to the MaxiMite source, then in the spirit of open source, Geoff, or anyone can add it back into the MaxiMite firmware for the benefit of all users. Unzip and save the help zip files onto your SD card in B:\help and type "help" without the quotes. Type "setup" without the quotes. There are three new boards being produced by Olimex. Because of the re-mapping of the schematic, we have had to get software assistance with a new boot loader and get the existing MM-Basic firmware patched to match. I chose Ken Segler, (http://www.kenseglerdesigns.com) a Back Shed Forum regular, to carry out this task, as Ken has shown his proficiency with porting the MaxiMite code to other platforms, as well as adding many new routines to MM-Basic. This fits nicely into a plastic box 130mm x 100mm x 30mm. The box will be laser cut to allow easy fitting. Arduino footprint can be seen in the middle of the board, however to make use of this, you would need to remove the cover, or remove the board fully from the case. An external shield adapter board will be available, and is listed below. This will be two boards that plug into each other with a small IDC flat ribbon cable. It was felt that the VGA and Keyboard connectors could interfere with any shields being added, because of the height of these connectors. It would also allow the board to be more readily used as a stand alone microcontroller without the extra connectors, if the user chose to do this. Connector to the left of the DuinoMite board, is for the I/O board, and the one to the right is the UEXT Connector. More on this later. Can be used on either the DuinoMite-Mega, or the DuinoMite-Mini boards, to add the Arduino footprint to the 26 pin IDC header via a flat ribbon cable. 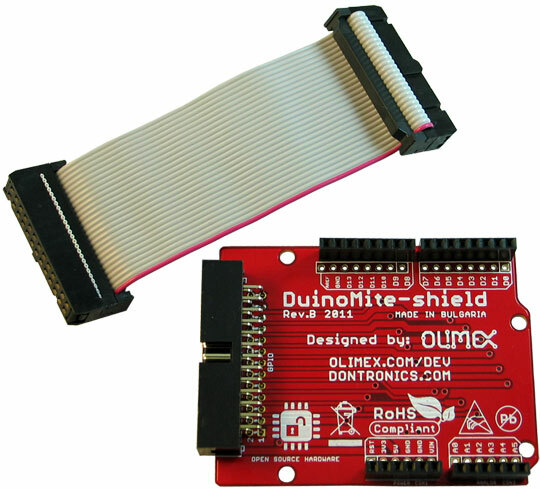 Dontronics DonDuino Cross was designed for the Maximite, however it will also work on the DuinoMite. 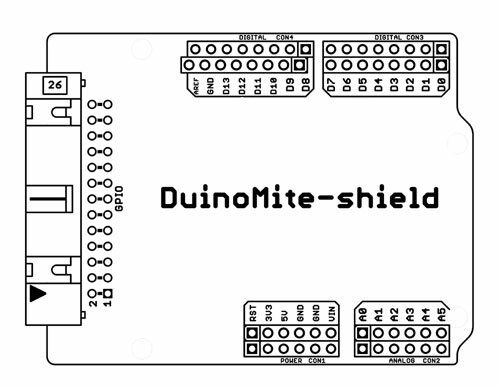 DuinoMite-Shield Board was designed for the for the DuinoMite range from Olimex, however it will also work on the MaxiMite. These features will vary with board type, and possibly there will be various levels of component population, so that users may be able to order boards at reduced costs. Again, to be determined. – Ethernet on board will just rise the cost, once we have UEXT we can connect MOD-ENC28J60 or MOD-WIFI to implement internet /ethernet connectivity. UEXT Connector is available on all boards. Dontronics ships world wide at a current cost of around $12USD internationally for all packages. As an Australian company, we have no mechanism to charge VAT or any state taxes. As most items are low value, customs usually allows these items through. You will generally find our prices cheaper than places like Element14 (Farnell) and Mouser. Order today, we ship tomorrow. In business since 1964, and on email 365 days a year. 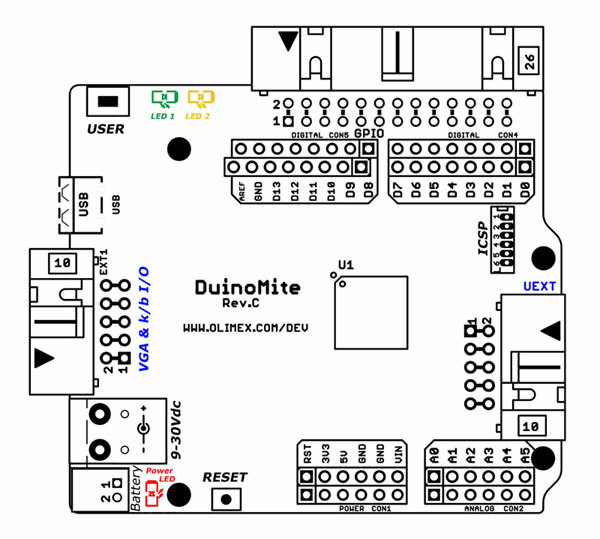 How about a 12 pin GPIO DuinoMite that is a 100% hardware compatible MaxiMite? 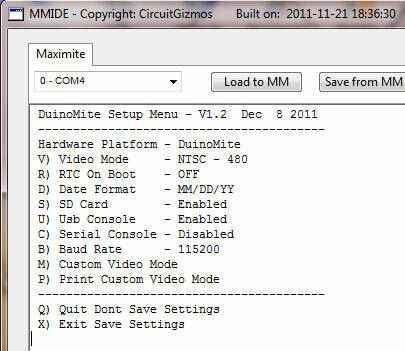 DuinoMite hardware is now supported by Geoff Graham, the MaxiMite designer. Please note that this is limited hardware support, in as much as only 12 of the 20 IDC GPIOs are supported by Geoff’s firmware, which is to be expected. But it does give you a 12 pin GPIO Maximite at a third of the price. It takes only a few minutes to do a firmware change from the DuinoMite hex file, to the MaxiMite hex file, and just as easy to roll it back into a DuinoMite, if you choose to do so. This means you can build it into what you want very quickly and easily, so you can choose the features you want. Our thanks to Geoff Graham for making this available. Wish to program the DuinoMite in C? Olimex Pinguino IDE supports the DuinoMite even now. No need for a special linker script as there is one for the 795 already. Use the existing bootloader that is programmed into the board. 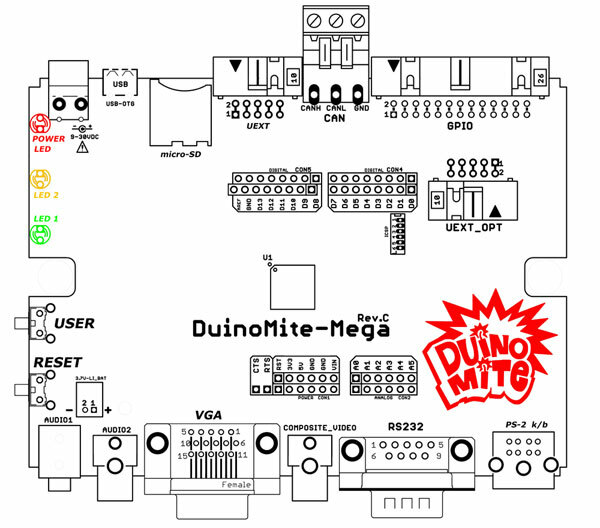 I believe the DuinoMite-Mega version is the correct model to call “The World’s First Arduino Computer”, as it is not only boxed, but is a complete computer system in the true sense of the word. OK, you can’t get to the Arduino footprint without an adapter, or taking the top cover off, but the shield footprint is there for users, if they choose to go this way. But I know there will still be the knockers that will spin the facts around, and say otherwise. If one of these boards doesn’t cover the definition of “Arduino and Computer”, then nothing ever will. And there may well be a user application that needs perhaps the CAN feature, as well as an off the shelf Arduino shield, so they may fit it all into a new case, or not even have a case at all. 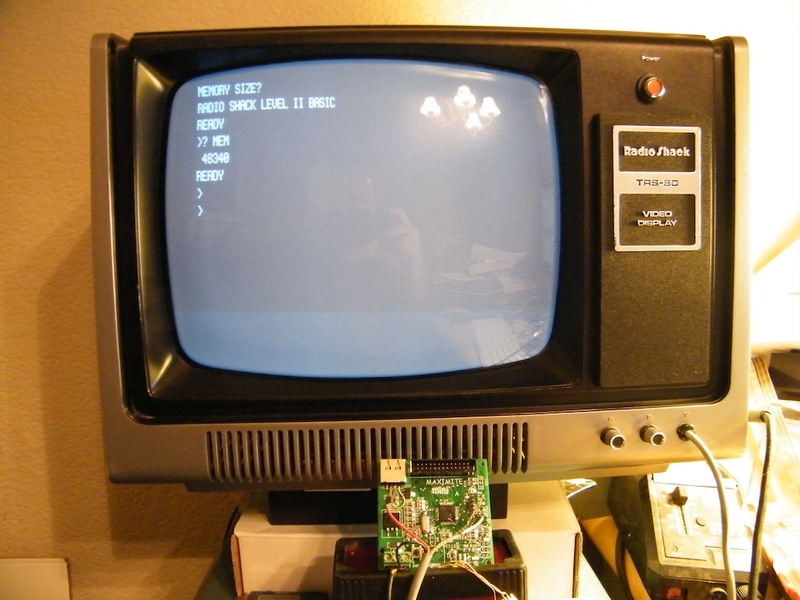 Already the Maximite has been adapted to run TRS-80 Basic, as well as Unix, and there is no reason why it can’t be used for C language development, the same as the Pinquino board has done in the past.